Former MK Ben-Ari slams authorities for trampling freedom of speech, threatening administrative arrest on activist in constant surveillance. 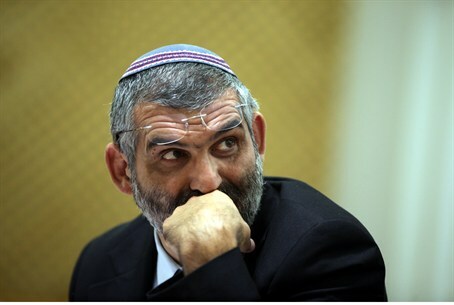 Former MK Dr. Michael Ben-Ari, chairperson of the Otzma Yehudit party that just missed out in the last elections, spoke to Arutz Sheva on Tuesday about the arrest and possibly administrative arrest of Jewish activist Meir Ettinger on vague suspicions of "Jewish extremist activity." Ettinger is the grandson of Rabbi Meir Kahane, who pushed to transfer hostile Arab residents out of Israel before being assassinated by an Arab terrorist in 1990. Ben-Ari was a close follower of the rabbi and through his party seeks to continue in his path. "I don't know Meir at the personal level, but this is madness by the authorities who have lost their senses," Ben-Ari said. Administrative arrest, a relic from the British mandate normally used against Arab terrorists, may be used against Ettinger and could have him jailed endlessly all with no evidence of any wrongdoing. "This isn't how a rational government behaves. When an Arab commits an attack, it's 'lone wolf,' and here in the attack at Duma village that they still don't know who did it" a large chain of Jewish extremists is being claimed as responsible, noted Ben-Ari. He pointed out that in the Duma arson attack last Friday the identity of the attackers remains unknown, and claims that Jews were behind it based on the presence of Hebrew graffiti come amid several serious question marks surrounding the case. Ben-Ari noted that "only today, four days later, they're gathering the (security) cameras" from the town, in what he termed another police "fiasco." "The best 'bust' they can do?" "Suddenly they're claiming there's an underground movement here," said Ben-Ari, noting on the arrest of Attorney Baruch Ben-Yosef. "I remember how they once arrested Baruch Ben-Yosef because they found a dirty uniform with him, a rope and cleaning materials together with a shopping list - that disappeared as if it didn't happen." "They're trying to mark off a 'v,' so they caught Ettinger, a man that journalists know, and if that's their big catch it's a sign of how much is lacking at the Shabak (Israel Security Agency)," he said. According to the former MK, Ettinger acts openly and not in secret, and is no more dangerous than leftist activists who the security forces let be. "There are anarchists who act like him, the boycott movement, (Sheikh) Raed Salah. Ettinger goes around and acts openly, writes openly - is he the number one target of the Shabak? Did a man whose every conversation is recorded succeed in establishing an underground? I suggest that they fire several Shabak members." Ben-Ari described Ettinger as a man of principles, saying, "an anarchist who doesn't accept authority is really something that worries the authorities, but this is a democratic country. Where is freedom of expression?" "As long as he isn't breaking the law, why are they arresting him? So what will they do now, arrest him administratively as if there's confidential material here? Without any inspection; this is just offensive. Even (radical Arab MK) Ahmad Tibi opposes administrative arrests." In a call for authorities to take decisive action against constant Arab terrorism, Ben-Ari said, "if only a thousandth of what they're doing against Jews they would do against the Arab terrorists." "The home of (former Hevron Chief) Rabbi (Dov) Lior was attacked time and again. We didn't hear about administrative arrests or underground organizations, they're waiting for a disaster," he concluded.